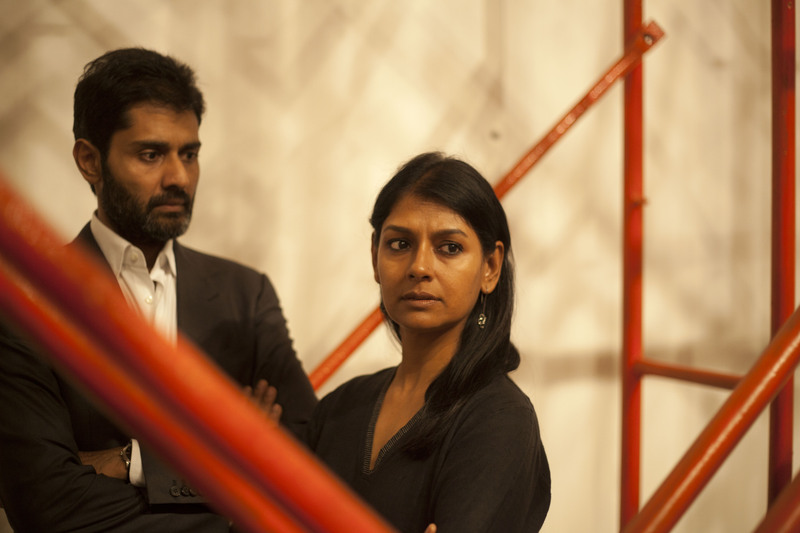 “And one woman in her time plays many parts”: Nandita Das on her favourite roles. 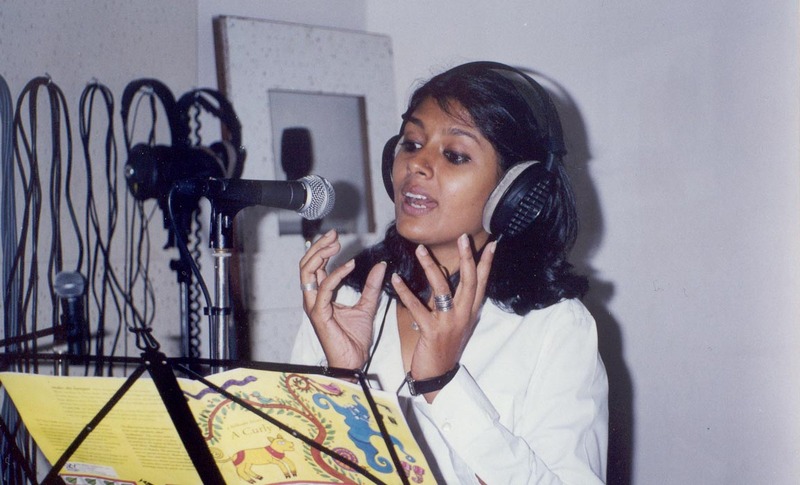 From Chitra Palekar’s ‘Maati Maay’, 2006. Photo courtesy: Nandita Das. “I know nothing of the role I play. – Wislawa Szymborska. “Life While-You-Wait”, Map: Collected and Last Poems. 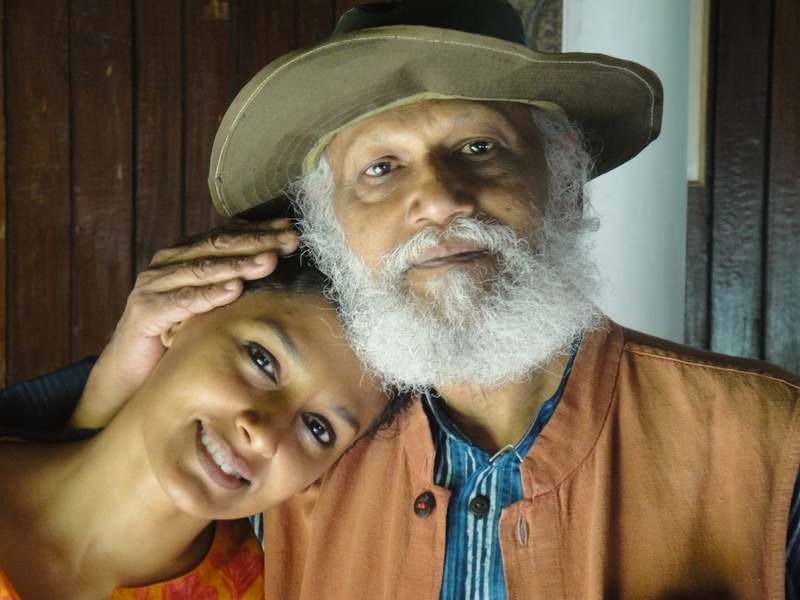 With father Jatin Das. Photo courtesy: Nandita Das. “As they say, our lives are often stranger than fiction. So often one comes across something that, if it was in a film, nobody would believe to be possible! I’ll never forget the time I was called for the “Hijra Habba” in Bangalore, roughly six years ago. Despite having done Fire and being a champion of LGBT rights, I had a fear of eunuchs as a child and hadn’t fully understood their space enough to get over the discomfort and deal with the experience. They convinced me to attend by talking about an oppressive police commissioner who was constantly putting members of the transgender and transsexual community in jail, saying that my presence there would be extremely beneficial. I couldn’t believe my eyes when ten thousand people from the community showed up at the “Hijra Habba”. “Three hundred and sixty four days a year, I wear a pant and shirt and go to work, I have a wife and child and I lead a life that isn’t mine. 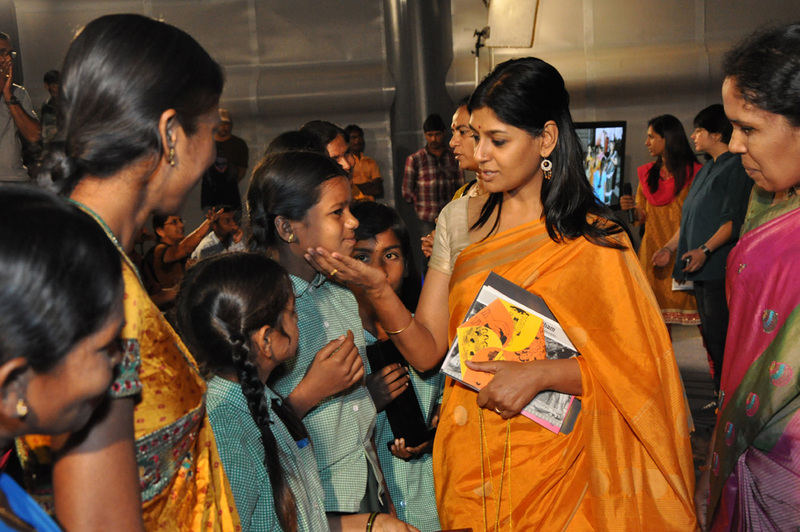 On this one day, I am flamboyantly wearing a saree, and I’m myself,” several of them told me. Just for me to understand their world and fathom how insensitive and cruel as a society we are, unwilling to let people live their lives just because their lifestyles doesn’t fit into our definition of what is normal or what is right… It was a serious moment of personal growth, making me think not just about that particular community, but each aspect of society shunned as ‘The Other’. I’ve spoken to young girls in Kashmir who wanted to commit suicide – what do you tell them, coming from such a privileged space? Everything you say sounds false, stupid, meaningless, insensitive. And yet, you’re there trying to give them some sense of hope, helping them speak and hear each others’ stories. You wonder, ‘I haven’t gone through their experiences, so what right do I have to tell them they should be more hopeful when there is very little to be hopeful about?’ Sometimes you go into these experiences believing that you’re the speaker, but what acting has done is provide me with different platforms to go places and learn and listen to whatever I’ve wanted to. You can wear your actor’s hat and then happily remove it once you’ve arrived where you wanted! When I visited Lahore a while ago, I listened to young girls talk about what freedom is. They shared their feelings about belonging to what is becoming the most hated country in the world because of Pakistan’s global perception, and how they grapple with wanting to be critical and intelligent while simultaneously feeling defensive because their country – like every other country! – is a mixed bag, and they resent being painted with the same brush. With husband Subodh Maskara for ‘Between the Lines’. Photo courtesy: Nandita Das. Behind the scenes for ‘Firaaq’, 2008. Photo courtesy: Nandita Das. “I’d love to make documentaries! In fact, when I was in college I made a documentary on Sardar Gurcharan Singh, the pioneer of studio pottery! He was in his 90s and very fond of my father and me – he used to give me a little clay and we’d do pottery under his neem tree, that sort of thing. My father once said, “He’s such a pioneer, but nobody will know – why don’t you make a film on him?” I had no idea how to go about it, but collaborated with a friend who’d begun to do some camera work, and we called it Imprint in Clay. I don’t even think I have a copy! However, every year on his birth anniversary, Delhi Blue Pottery – which he started – shows that film. They’ve given me a VHS, I’ll have to find a way to convert it! Someone asked me to do a documentary for the NSD… I don’t even remember how that came to me, now that you ask! I ended up making a piece called Khel Khel Mein on how theatre can be used in education. And then someone at the Centre for Science and Environment said, “We want to make a film on rainwater harvesting. Would you be interested?” This was in 2003 when I was already acting, and I jumped at the opportunity. Telling a story in 90 seconds is quite a challenge! Ravi K. Chandran, a cinematographer who I’ve worked on several films with, did the camera work for me. And then Firaaq was my first film in 2008. 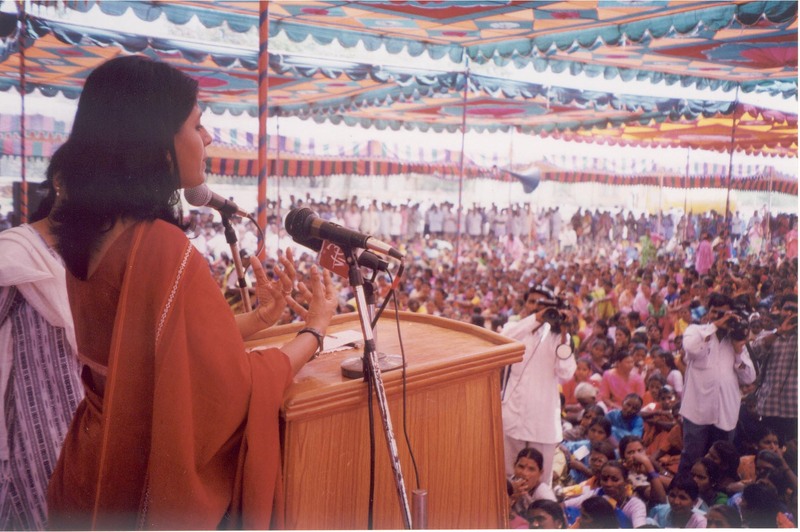 Women’s day at Anantapur in Andhra Pradesh, 2003. Photo courtesy: Nandita Das. “Since all my work is provocative in a sense, I have hordes of people who come up saying, “Aren’t you ashamed you did Fire? Somewhere you must be feeling a little sense of shame, right?” Or “Very conveniently you did Firaaq – why didn’t you start the conversation with Kashmir, why keep taking us back to Gujarat?” Mind you, these are the same people who will endlessly invoke the Partition and Mahmud Ghazni! The idea relentlessly remains that one attempts to engage, to see whether one can get the point across. You can’t pay too much attention to the bigoted comments – even if I retweet an article on Twitter, I’m told “Take your child to Pakistan!” or “We’ll confiscate your passport!” or “You’re an anti-national, you’re a lesbian!”. Art changes things very gradually and intangibly. You can only feel the change when you see your own responses altering. You think you’re very similar to your self twenty years ago, and yet you aren’t. I got a long letter from someone who told me that his girlfriend was from Pakistan, and they’d been almost resigned to end the relationship because of the resistance from their families when they saw Firaaq and thought, “If you can make the film, we can be together.” Another actor came up to me saying, “I thought I was very liberal, very secular, but now I find myself identifying with these characters and it makes me wonder.” Many different things have to happen simultaneously for a tangible change – it can be one film, one conference, one column, one Junoon talk – they all converge into this sea of stories out there! You’ve just got to keep the faith, otherwise you won’t want to work! Reading for ‘Karadi Tales’. Photo courtesy: Nandita Das. From Mehreen Jabbar’s ‘Ramchand Pakistani’, 2008. Photo courtesy: Nandita Das. Behind the scenes for ‘Firaaq’ with Naseeruddin Shah. Photo courtesy: Nandita Das. “The one thing I owe my father tremendously for is the lack of fear of failure. I was raised to be less wedded to the outcome than to the journey – which isn’t to say I wasn’t terribly tense for the premiere show of Between The Lines! As a result, I went into direction quite seamlessly. As an actor, you are the means and the vehicle on stage. But I was also the writer and director, so initially my mind also jumped to the light that didn’t go on, the line that didn’t quite sound right, the varying sound levels! When I did Firaaq, I didn’t have a director’s training. My co-writer brought it a lot of the grammar, but I remember a director friend telling me, “You can make out that you aren’t trained because you sometimes break the grammar, not having a rule book to stick to.” I winced, but he meant it as a compliment. There are advantages and disadvantages, and without making value judgements, I’ve found that spontaneity can lead to interesting revelations! I see so much of my upbringing in the aesthetics and art direction of Firaaq. As a director, the fun of it is that you can do what you want! As for the feeling that I am a woman – am I conscious of it when I’m directing? Do I perceive myself as a ‘woman director’, as many panels call me? The fact that I’m a woman must influence some things, and you recognise that. Just as there is a male gaze, there is a female one. As for the label, you resist that! With Vihaan. Photo courtesy: Nandita Das. “To be asked about my exact profession is a nightmare – if you asked me today, I’d say that I spend most of my time being a mother! It has changed my life utterly, and takes precedence over everything else. Vihaan’s presence is constantly impacting my choices, but if someone asked me to write down my profession, I couldn’t write ‘Mother. Advocate of social issues. Actor.’ Note that money isn’t what you’re basing this list on, since you call yourself an activist (for which the work is completely pro bono) which is something you just do. But even as a mother, you do a lot of things! I use stories as a vehicle to teach Vihaan, but just as we don’t like films that are too heavy handed and message-y, children don’t like being taught big values in a big way. Once in a while when I try, he completely dismisses them and rightly so. It reminds me that I’m being quite didactic and boring, that these values have to be lived. He’s such a great teacher – if you’re being even a little dishonest to yourself or to him, he’ll catch you in a second. Children make you much better human beings for sure – and that’s the struggle, because they reveal your demons to you, and you don’t want to be the person they reflect back at you! Sometimes, I try to give him the upbringing I had, or try to rectify the things I went through – but of course it doesn’t always work. I strongly believe that children should grow up in nature, that they’re stuck too often in a room with plastic toys, and so I try take him everywhere I go. We’re performing in Singapore this weekend and I can’t take my nanny along with me, which means that he’s going to be sleeping and eating with somebody new. I’m performing about these very issues, and worry about them all the time. With Mercy Mathew aka Daya Bai. Photo courtesy Nandita Das. “Growing up in Delhi meant watching a large number of performances, exhibitions, and concerts – I saw plays at the National School of Drama (NSD), and I distinctly remember the open air theatre at Triveni Kala Sangam, where Habib saab did Charandas Chor and Agra Bazaar. And as a child I was struck by Naya Theatre; it was very animated, with beautiful music and folk artists, and is something that has stayed in my memories. Many years later, I worked with Habib saab on a play, so it all came around. I’ve been fortunate to have met very interesting people through both my film and human rights work, who are doing some incredible work without any media glare, and lead lives of such deep conviction and courage. Of course, all of us have a story within us, and some stories remain in our consciousness. 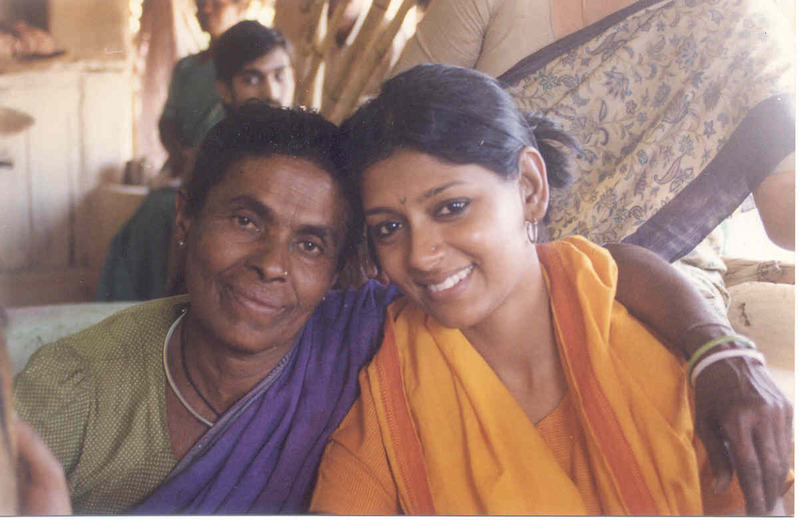 I’ve this incredible friend, a lady called Mercy Mathew who is fondly called Daya Bai by the village. She is a Malayali who lives in Madhya Pradesh, and works independently on issues related to land rights, the selling of girls, and general issues of women. You know, when the media asks me about ‘my inspiration’ expecting a famous name, I start going on and on about her. She’s living by example. Conceptualised and interviewed by Tanvi Shah. Join us for Nandita Das’ open session on the Journey of Making Firaaq, at MCubed Library (opposite Bandra Gymkhana) at 7 pm on Thursday, September 3. The session will look at her experiences creating a work of art that has a strong social conscience, with the multiplicity of perspectives, stories and challenges it puts forth. We look forward to seeing you on the 3rd! It is wonderful to read about the kind of person you are,.your achievements make me happy. Go ahead and help in every way you can too make this a better place to live. This will make your life very rich in happiness. A story loaded with inspiration! One woman and the many not so conventional faces!